Big Willy: Oh, what beautiful corn! Another hit from the 2013 Toronto Fringe Festival has been given a commercial run. This is the hilarious parody of musical styles, The Musical of Musicals (The Musical!) from 2003. In 95 minutes the musical tells the same basic story (“You must pay the rent”, “I can’t pay the rent”, “I’ll pay the rent”) in five different musical styles. Each mini-musical has the same four-actor cast and each is accompanied on the piano by Michael Mulrooney, who also reads the stage directions. What the show lacks in production values it more than makes up for in the all-out performances of the cast and in the uproarious spot-on satire of co-creators Eric Rockwell and Joanne Bogart. The first musical is Corn! in the style of Rodgers and Hammerstein. Here Rockwell and Bogart use Oklahoma! as their base musical from which they make allusions to the recurrent character types and plot developments in other R&H musicals from Carousel, to South Pacific, The King and I, The Sound of Music and even Cinderella. Here Big Willy (Adrian Marchuk) can’t decide if he’s in love with farm girl June (Dana Jean Phoenix) until evil landlord Jitters (Mark Cassius) says he’ll marry June if she doesn’t pay the rent. Aunt Abby (Paula Wolfson) provides the consoling contralto hymn exhorting June to “follow her dream”. The mini-musical even includes a parody of the “dream ballet” of Oklahoma! This the most successful of the five segments because virtually every phrase is packed with terrible puns on song titles from other R&H musicals. Choosing one base musical to work from also proves the best means of parodying a style while alluding to other works in the same vein. The second mini-musical, A Little Complex in the style of Stephen Sondheim, is probably the weakest of the five. It tries to turn the evil landlord Jitters (Cassius) into a combination of Georges Seurat and Sweeney Todd who plans to murder his tenants for accidentally throwing out his artworks. Rockwell and Bogart hit on Sondheim’s intellectualism, his habits of writing multiple lines with the same rhyme, his use of dissonance and the general neuroticism of his characters. The problem is that for a composer who pioneered the plotless musical it is hard to make the landlord-tenant plot work. Nevertheless, this section provides some great imitations of Sondheim’s style. The reverie “Birds” sung by “Jeune” (Phoenix) is a hoot and the parody of “I’m Still Here” for Abby (Wolfson) from Follies becomes the comically depressing showstopper “We’re All Gonna Die”. The third mini-musical, Dear Abby in the style of Jerry Herman, goes back to the technique of Corn! by using Herman’s Hello, Dolly! as its base musical from which it makes satirical jabs at Mame and La Cage aux Folles. Rockwell and Bogart emphasize Herman’s musicals as primarily star vehicles for over-the-hill stars who don’t need to sing or dance in his works but instead just parade about in fabulous costumes. Wolfson is great as the title Manhattan socialite who solves everybody’s problems by making a match between her nephew William (Marchuk) and Juney-Fae (Phoenix) and getting the landlord Jitters (Cassius) to embrace his true nature. This gives Cassius a chance to do a fantastic Carol Channing impression. In the fourth mini-musical, Aspects of Junita in the style of Andrew Lloyd Webber, Rockwell and Bogart use a different satirical technique by having characters from various Lloyd Webber shows meet each other. Thus Junita (Phoenix), hopes that if she becomes a rock superstar she won’t have to pay the rent to her strange mask-wearing landlord Sir Phantom Jitter (Cassius), who lurks beneath her apartment building. Meanwhile Bill (Marchuk), dressed as Che Guevara, comments on Junita’s rise and fall, while once-famous diva, Abigail von Schtarr (Wolfson), reminiscent of Norma Desmond from Sunset Boulevard, gives Junita advice. Rockwell and Bogart point out Lloyd Webber’s use of stage effects to cover lack of imagination and in Junita’s recurring song “I’ve Heard That Song Before” of his invention of the one-song musical. A choral sequence “Go Go Go Go” is a blend of the choruses of Starlight Express, Joseph and the Amazing Technicolor Dreamcoat and Cats. Junita and Bill have a very clever duet, “We Never Talk Anymore” about the problem of being stuck in a sung-through musical. And the last mini-musical, Speakeasy in the style of John Kander and Fred Ebb, is probably the next best after Corn! Here the base musical is Cabaret, reset in Chicago, with the landlord Jütter (Cassius) as the Emcee. Satirical targets here are Bob Fosse’s typical sensual choreography featuring flexed wrists and bentwood chairs, the Kander’s faux-Kurt Weill music and the recurrence of gay characters like Villy (Marchuk), an allusion to both Cabaret and The Kiss of the Spider Woman. 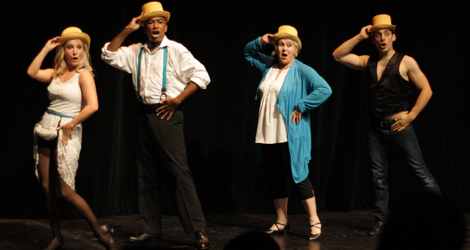 As an epilogue the cast breaks out into the high-stepping number Done, which sends up the song One from Marvin Hamlisch’s A Chorus Line, including its signature readjust-the-hat-brim move. If there is a problem it is the intermission between scenes three and four. The appearance of the word projected on the back scrim brought out a groan from the audience likely because they were so into the show they didn’t want a break. The cast and pianist Mulrooney do a super job. Paula Wolfson stops each of the five mini-shows not just because each of her numbers is written as a showstopper but because of how well she captures each style and how well masterfully she puts over each song. Cassius doesn’t have much to do in Corn!, but, besides his Carol Channing in Dear Abby, he does a side-splitting take on Michael Crawford as the Phantom in Aspects of Junita and as well as puckish Joel Grey in Speakeasy. Adrian Marchuk has such stage presence and such a fine voice it’s surprising that Toronto has, until now, only seen him in a major role in Jersey Boys. He is also has an excellent sense of comedy as evidenced by his hunky, drawling Big Willy in Corn! and his newly gay Villy in Speakeasy. Phoenix is a deft comedienne. She uses a Broadway tone for most of the action but pulls out a rounder operetta voice to hold high notes over the rest of the chorus. She knows how to get a laugh in all her roles, but she is probably most sublime when she sings the loony pseudo-Sondheim “Birds” about the creatures her character constantly sees circling about her head. This is a show for people who love musicals. The final chorus says the MoMtM was written for the “cognoscenti” and indeed that’s true. The more familiar you are with the various composers’ works the more you will get out of the satire. It would be great to have Rockwell and Bogart’s take on George and Ira Gershwin, Cole Porter and Lerner and Lowe, but five iconic styles are good enough and make us long for the period when composers or music teams could write multiple hits in an instantly recognizable style. For anyone who loves musicals, this show would make a great gift. Photo: (from top) Dana Jean Phoenix, Mark Cassius, Paula Wolfson and Adrian Marchuk; Mark Cassius and Dana Jean Phoenix in Aspects of Junita. ©2013 Josie De Luzio.